Exceptional modern village house overlooking pool with views of sea. Our home is situated in the centre of a quiet village and is beautifully furnished in a modern Andalucian style. Marble floors throughout with an open fire place in the spacious sitting room which has patio doors onto a large terrace. 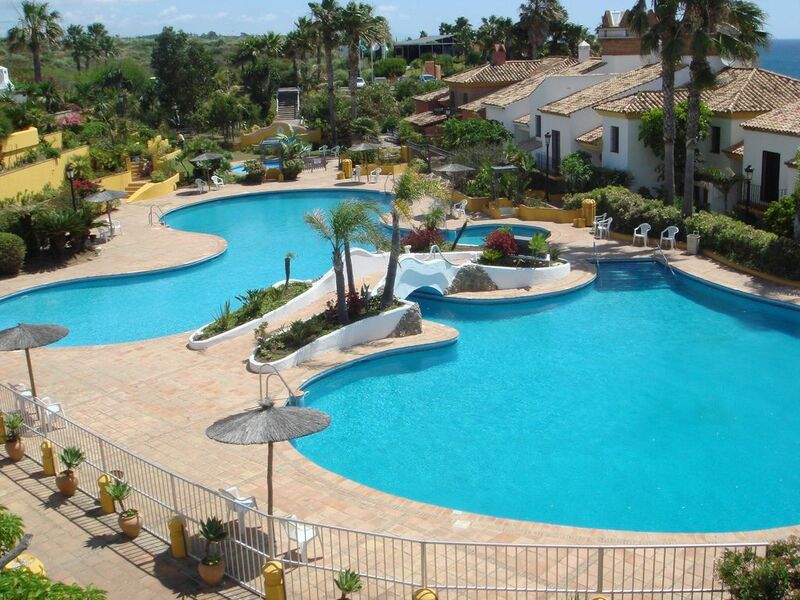 Recreation includes 2 miles of beach, swimming, paddle tennis courts, Alcaidesa's own golf course, and superb food found in local tapas bars and restaurants. Local Area: Just 15 minutes from Gibralter, the national coast road CN 340 connects Alcaidesa to Marbella (25 minutes) and Malaga (60 minutes). Our village, 'Loma del Rey' is found a mile off this main road, nestling at the foot of a mountain with the Mediterranean and the rock of Gibralter acting as a spectacular backdrop. Within striking distance are Cadiz, Tarifa, Ronda (and the white villages), Estepona and Puerto Banus. Horse riding, trekking and walking are all popular pursuits, and for bird watchers, many rare species are seen migrating over Alcaidesa from January to March. Golf Details: Alcaidesa's links golf course is nothing short of spectacular, winding it's way along the coastline and then inland to the hills above the village. Close by there are famous championship courses, namely Valderrama (host to the Ryder cup in 1997), Sotogrande and San Roque. Together with Alcaidesa these form the 'golden triangle.' Also near by are the superb Almenera (opened in 1998) and La Canada (lovely 9 hole course). Paul & Elaine Edward live in the UK close to Guildford, Surrey. At the beginning of this year we completed the upgrading and refurbishment of the house including installing a new kitchen. The house is situated in a beautiful modern village with access to the beach just a few metres walk away. Its ideally situated for relaxing or to explore the area including places such as Ronda, Jerez, Tarifa, Estopona and Gibraltar. Fireplace is for aesthetics not for burning wood. The communal swimming pool is open from 15th June - 15th September and during that time is supervised by a trained lifeguard in accordance to Spanish law. This house was lovely.It has been tastefully modernised and is perfectly equipped for a family. It is the closest house to the pool and two minutes walk from the beach. The views from the master terrace are beautiful. I would thoroughly recommend it to couples and families for a wonderful and quiet retreat. We had a great time at Paul's home in Alcaidesa. Everything worked perfectly, the communication before and during our stay was good and helped us feel comfortable from day one at the house. The fully equipped house and area are wonderful, a very nice urbanisation with a good pool and the proximity to shops and the beach was a big plus! Thank you very much and we hope to be back soon! We had a wonderful week in Alcaidesa. The property was as described - clean, well equipped and well positioned. There was plenty of room for our family of 5, it had everything we needed and more, and the views from the balconies were stunning. The wide sandy beach is a minute's walk away and the pool just outside the property, so plenty for the water babies to do! Gibraltar is 20 mins away so easy to visit. We went a few times, did scuba diving, dolphin boat trips as well as The Rock of course. Alcaidesa is a great base for exploring - Sotogrande, Cadiz, Tarifa to name just a few. The owner Paul was a pleasure to deal with and did everything he could to facilitate our holiday planning. There are plenty of shops within a few minutes drive to cater for the family and a pleasant drive from the airport makes it a convenient place to go. Would definitely recommend! We had a very enjoyable holiday in Paul and Sue’s Spanish home. The house is very nicely furnished and decorated and equipped with everything you could possibly need. Loma del Ray has lots of character, it has more of a village feel than many other “urbanisations” and it is a pleasure just to wander through. The house is situated adjacent to the large and lovely pool and there is a gated access straight onto the beach – spoilt for choice! The sandy beach really is long, it is very easy to find a spot and there is a good beach bar/restaurant. Alcaidesa is well placed and there is a wide and varied selection of restaurants and shopping within easy driving distance. Paul and Sue were very helpful and gave plenty of information to get the most out of our stay. I have to agree with all the other comments posted and would not hesitate to recommend it. We visited Paul and Sue's beautiful home as we were attending a wedding in Gibralter. Firstly, what a perfect location. We had our 2 young children with us (6 and 4yrs) who spent all week around the pool or on the beach. Second, it was so relaxing and peaceful that we hardly felt the need to do anything other than eat and drink in the lovely beach bar/restaurnat or take a dip in the pool. We had the added luxury of being there for the Olympics which we managed to catch each evening on the TV. Some amazing memories and one of those holidays that we will never forget. We will be back!!! It is always a pleasure to read that our guest love our home and its location as much as we do. What a gem. A lovely village with the beach on the doorstep. Its hard to imagine a better location. The villa is well appointed, spotless and the furnishings and touches show the hand of someone with an eye for design. We really enjoyed our 5 day stay, wish it had been longer, and Sue and Paul's restaurant recommendations were excellent. We shall definitely be returning for more boquerones. Many thanks. Alcaidesa is found between Gibraltar and Sotogrande. It has a private entrance off the N340 dual carriageway at junction 124 and our village is next to the sea, a few minutes drive from the entrance. Alcaidesa is 55 minutes drive from Malaga and 15 minutes from Gibraltar. Golf: Alcaidesa's links golf course is nothing short of spectacular, winding it's way along the coastline and then inland to the hills above the village. Close by there are famous championship courses, namely Valderrama (host to the Ryder Cup in 1997), Sotogrande, La Reserva and San Roque. Together with Alcaidesa they form the 'golden triangle'. Also near by are the superb 27 Hole Almenera (opened in 1998) and La Canada (a lovely 18 hole public course).